Lexbe eDiscovery Suite Platform individual case contacts are located under the 'Case' tab in the top navigation menu. Lexbe’s shared contacts list lets your litigation team keep your contact info of experts, opposing counsel, your team members, etc., in one place. You can search case contacts by 'Current Case' or 'All Cases In Account'. Type: The icon illustrates if the contact is a person or organization. Name: The Name column includes the name and title of each person or organization. Address: Allows inclusion of street address, city, state, zip code and country, as applicable. 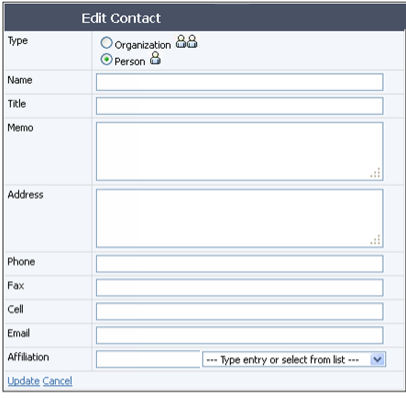 Contact Information: Allows inclusion of phone, cell phone, fax and email contact information. When you show contacts 'All Cases In Account', by selecting contacts from the main table it will give you the ability to either add or remove them from your cases in Lexbe eDiscovery. On clicking on this button, you will receive an entry form to add a new contact. You can identify the entry as an individual (person) or an organization. Other entries are available for 'title', 'address', phone numbers, email, and affiliations. To save, click on the 'update' link. The case contacts screen is not intended to track 'case participants' such as witnesses, parties, etc. Instead use the 'case participants' module, located here. (case participants is under 'Analysis' tab). You can also edit your contact details by clicking on the hot link 'edit' column from the main table. You can delete contacts no longer needed. Deleted entries will be completely erased from the contacts. On the left side of the screen is an export menu. Clicking on 'Export to Excel' here allows you to export and open a listing of Case Contacts in an Office application for further formatting and printing. Clicking on ‘Import’ allows you to import to Lexbe eDiscovery Platform your list of contacts. Please note that this function only imports contacts created from an Excel file.